Sunday was the debut of the Grand Finale of the Fashion show. The best part of the Fashion Show is being one of the dressers in the backstage area—and they actually paid me for this pleasure. 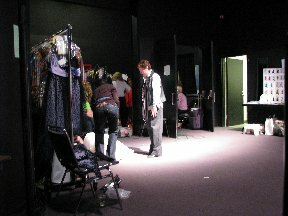 The show is professionally organized with professional models, stylists, makeup artists, and accessories. The models are all rail thin and skyscraper tall but all a lot of fun and they do actually eat—a lot! The job as dresser involves handling the lovely garments with your own personal hands and you can see up close all the lovely details that you simply cannot see from the stage. Some of the garments appear rather ‘plain’ from stage but are actually incredibly complex and detailed. Some of the things that were memorable for me was a two piece dark blue walking suit with little motifs up and down the jacket and along the cuffs of the legs. Each little motif had about a hundred or so tiny little beads hand-sewn on. Another garment by Ludmila from New York featured a painted city night skyline with hundreds of rows of prairie points folded from ½ inch silk ribbons. Gilbert Munoz created a garment from a dark olive green that featured padded hips and a flounce of silk ruffles down the back. One dress had dozens of free embroidered roses that all of us agreed would have made a gorgeous wedding dress had it been made in off white. Petticoats were in this year and I think they actually had names—they were so huge! And one of them liked me as it was always curled around my feet. I had the pleasure of dressing Arnold again—a really nice guy and definitely eye-candy for all the ladies in the audience. We had to do a couple of quick changes and one outfit includes no shirt! Thursday is the show for Festival; Sunday was for the Market attendees. I think we’re all sad that this is the last year. What do you mean the last year?? ?This was the best year! !